As background, I was a little sceptical of the value of a lesson with the pro on the first day of our trip. I thought the lesson was more of a nice gimmick than having any real benefit. But, during and after the lesson time, we were all pleasantly surprised and thankful to have the opportunity with Iain Colquhoun at Dundonald Links. Iain did a very good job with the 1 hour lesson time – spending time with each of us individually and as a group giving us tips on how to deal with the strong winds and turf conditions found at most Scottish courses. He was very knowledgeable and a very focused during the session ; also a great host and ambassador for golf – providing us with good advice for our play and stay overall. As well, the 1 hour lesson provided us with a really good warm up session – which was good to have after spending the previous 16 hours traveling. And, since our first round was at Prestwick later that day, and there is no on-site range there, we were mostly warmed up for the first round. That’s all – thanks, Woody. You folks get a 10/10! From the initial response to the several iterations that followed Kerry-Ann was phenomenal! She had an answer for every question we had and was very prompt in all of her responses. I would also like to recognize Peter Mitchell who was quite the gentleman and provided us with excellent trip information. We had lots of questions and he readily addressed each and every one of them. He also provided us with some swing tips during our practice session. I still think of one every time I’m over the ball and am improving every day. Thank you Peter!!! Just keep doing what you do best and that is unprecedented customer service. When we Googled “golf tours Scotland” you obviously know we received several results. 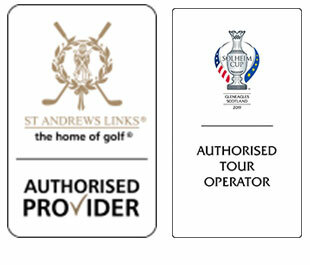 You were selected from 8 respondents and our group is so glad (and lucky) that Scotland Golf Tours was our selection. We will all remember this trip forever. It was absolutely PERFECT! If you are thinking about getting a group together and wonder what it might be like over there with a bunch of guys having some fun on the golf courses, have a look Steve’s video he made of his Scotland Golf Tours trip. Steve will be known to many of you as the daytime host of the radio show on Yahoo Sports Radio in the US. This is fun to watch! I wanted to take a moment to thank you for the incredible service my group experienced during our whirlwind four days in Scotland. As you clearly already know, your company provides something astoundingly special to anyone with a love for the game of golf. Greetings from the United States…so miserable to be home! It’s taken me a few days to recover from the time change and withdrawal from Guinness (aka. chocolate milkshake) Anyways, I wanted to personally say THANK YOU for an amazing golf trip!!!!!! From start to finish it has been a delight working with you guys. I plan on referring your company to anyone planning on visiting Ireland or Scotland in the near future. The courses were incredible (Whistling Straits on steroids). My favourite day was Old Head…amazing piece of real estate. Each course was unique and very challenging. A fan favourite was Tralee back 9…holy ****! We lucked out with the weather all week (70 degrees and sunny)…I’ll save the rain gear for when we visit Scotland in 5 years. It was a once in a lifetime trip that all 10 of us will never forget…thanks again!!! Everyone that came along with us on our golf trip absolutely loved their time in Ireland. It was for many including myself the greatest golf trip. Like you mates say over there, you guys plan it and we play it!!!!!!! I just wanted to extend my gratitude to you and your team for the most memorable trip, especially the Old Course. It was so nice to meet you in person. I always knew that this was going to be something special, but truly the experience far exceeded all our expectations. Our gratitude to you for the excellent organisation of our quite hectic itinerary, everything went as smoothly as we could’ve wished apart from some showers at Royal Troon. We had a great trip in no small part due to your excellent planning and attention to detail. This was my 7th trip to the UK for a golf vacation and this was no doubt the best ever. Thank you and all the others at Scotland Tours for making that possible. We are already beginning discussions about a possible trip to the Ryder Cup next year and a trip back to Ireland in two years. You will be the first contact we make. Incredible trip to Ireland last week. I can’t tell you how much fun we had and it was due in large part to the incredible efforts of Kerry-Ann MacInnes. She is amazing and we will be using Kerry-Ann and your organization again in the future. Thank you for the trip of a lifetime. We thoroughly enjoyed it. Kerry-Ann MacInnes was incredible. She was knowledgeable and friendly and was able to recommend the perfect places to stay and visit. She was also incredibly helpful and flexible in accommodating numerous changes to our itinerary. She is a true gem and an asset to your organization. I just wanted to write to thank you for setting up our recent golf vacation. It was great. I told my wife “it was everything I thought it would be and more”. You did an excellent job arranging a wonderful trip. Larry and I would love to come back and when we do we will certainly use Scotland Golf Tours. Everything was great!! You guys did a fantastic job. Everything went like clockwork. You even controlled the weather. The accomodations were great, the golf was unbelievable and your dinner suggestions were excellent. Thanks for all of your help and assistance during this venture. I will recommend you guys to all of my friends for future travels to Scotland. Thanks again. Just wanted you to know that we returned last night from a truly memorable vacation. Great golf, great friends and way too many laughs! Thanks for helping us put this together! I wanted to let you know how much we enjoyed the trip and your support was fantastic. If we return you will get our call. If I can be of help as a reference or anything in the future please feel free to contact me. Well done! !